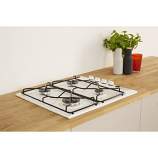 Add a touch of style to your kitchen with the Hotpoint Built-In Gas hob, four rings of supreme gas power for tackling every meal . Featuring one fast, two semi-fast and one standard burner, enjoy the robustness of hinged cast iron supports to keep your pans level, whilst remaining easy to clean. And because a safe kitchen is a happy kitchen, each area uses an automatic ignition switch and is fitted with a flame safety device to ensure that when the flame goes out, the gas supply stops, allowing you to slumber with peace of mind.